DRO-160 fuse disconnecting switch are mainly used in circuits with high short-circuit current and motor circuit as power switch, disconnecting switch or emergency switch. Rated insulate voltage up to 50Hz AC, 690V; Rated working voltage up to 660V; Rated working current up to 160A; Rated short-time withstand current (valid): 3.2KA/1S. 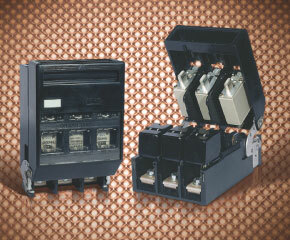 The fuse disconnecting switch complies with GB14048.3 and IEC947-3. The switch with three-phase and half sealed structures is made up of two parts: the seat and the cover (melt-loading device).The front operation can observe the rated data of the fuse links and indicator status. The switch can be matched with NH000 andNH00 fuse. The switch has features of small volume, reliable operation, convenient fuse install and removal and small-required manual operation power.